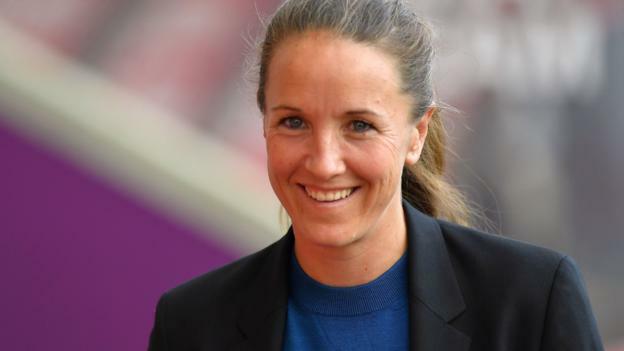 For Casey Stoney, early-morning boxing classes, obstacle courses and dance lessons have all played a part in her first season as head coach of Manchester United Women. Managing a heavyweight club in the predominantly part-time Women’s Championship, perhaps the biggest hurdle she had to face was getting a brand new squad to gel quickly. But victory over Aston Villa on Wednesday will deliver a knockout blow in the promotion race, securing at least a top-two spot less than a year after the women’s side reformed. So how did dancing and dawn sparring sessions help the former England skipper – who was capped 130 times – win 14 of her first 16 league games as a manager? “When they came together last summer, they were effectively 21 strangers coming in to a room,” Stoney told BBC Sport. “It’s quite incredible where we’re at, in terms of the team togetherness. That’s not by chance. Former centre-back Stoney calls her off-field activities “Team United”. “We actually put it to the players to come up with their own ideas, and they had to pitch it back to us and the best team won,” the 36-year-old added. “‘Team United’ was my brainchild, something I was keen to do. Things away from the pitch, I think, are always key. “We brought a dance teacher in – that was my biggest fear. Dancing in front of the group – I couldn’t stand that. But some of them loved it, some of them hated it, just like some of them loved the boxing and some of them hated that. “It works on different aspects of teamwork and the different dynamics within the team, and facing your fears, as well as communication skills. United are two points away from securing a place in England’s top tier, subject to receiving a licence for the Women’s Super League this summer, which is expected to be a formality. Despite playing in the second tier, they have also reached the semi-finals of the League Cup and the last eight of the Women’s FA Cup this season, before losing to top-flight sides Arsenal and Reading respectively. So presumably Stoney has enjoyed her switch from the back four to the technical area? “I’m in the best job in the world, at a great club,” she said. “I just want to be me, and the best version of me. “We now are part of the club’s history, the club’s history-makers, these players and staff for season one. “There was no pressure from the club to go up, but it looks like we’re on track to do that. After ending her playing career at Liverpool in February last year, Stoney initially joined England boss Phil Neville’s backroom team, before United opted to end their 13-year absence from the senior women’s game. But how much has life changed for her since accepting one of the biggest jobs in the global women’s game? “It’s changed massively,” Stoney replied. “I never really realised, as a player, how demanding it is, as a head coach. “But one of the things with this job is, you get out what you put in. And I’m all or nothing. I was like that as a player and I’m like that as a head coach. I dedicate a lot of time. “I’ve not quite found the work-life balance. I’d like to see my kids a little bit more, but that’s because I’m very dedicated to my job. Stoney, who has three children, believes she owes it to the club and her players to give her all to the job. “I’m a stickler for being perfect, which is impossible, which sometimes drives me to insanity and causes me a lot of stress,” she added. “But it also keeps me on my toes and makes me realise there’s so much more I’ve got to learn, so much more I’ve got to do, and so much more I can do for the team. United’s four remaining games this term will see them host Aston Villa on Wednesday and Crystal Palace on Saturday, before travelling to Millwall on 28 April before their home finale against Lewes on 11 May.